Growing microgreens at home will allow you to produce an ongoing supply of the tastiest, most nutritious food available anywhere. 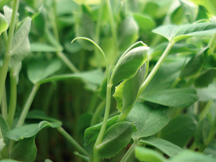 A recent study* showed that microgreens are between 4 and 40 times more nutritious than the mature plant! 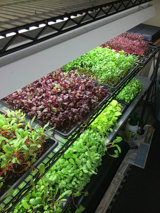 Hundreds of varieties of edible plants can be grown as microgreens. Microgreens are simply dense plantings of certain garden-variety vegetables and herbs, harvested when they are very young. The difference between growing sprouts and growing microgreens is how long you grow them. Sprouts are seeds that are germinated in water with no added nutrients, and are eaten just after they have sprouted. You eat the whole thing - root, seed coat and all. Sprouts are nutritious because they have all the goodness that the parent plant put into the seed to ensure its survival and the growth of the next generation. But if you took those same seeds and instead of germinating them in water, planted them in nutrient-rich soil and allowed them to grow for one to four weeks, they would develop massively higher nutritional levels and be termed "microgreens". Part of the fun of growing microgreens is being able to make custom flavor mixes. Try cabbage, arugula and amaranth as a combo-bite. Play around and create your own faves. Growing microgreens is very seed-intensive. In other words, if you planted one cabbage seed in the vegetable garden and let it grow to maturity, you'd have three pounds (at least) of cabbage. But when you plant one cabbage seed and harvest it as a microgreen, you get a tiny fraction of an ounce for that one seed. So to get several ounces of microgreens, you have to plant a lot of seeds. After a seed germinates, the little “leaves” that first emerge are not really leaves, they are called “cotyledons”. They are a different shape than the true leaves that form later as the little seedling grows, and fall off after their job is done. 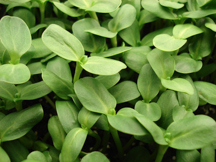 Microgreens are usually harvested during the cotyledon stage, up to (or a bit after) the time the first true leaves begin to appear. The cotyledons' job is to gather sunlight and start building the massive amounts of vitamins, antioxidants and phytonutrients that the seedling needs to explode into life. Growing microgreens is done in trays or other shallow containers, indoors under lights, on a sunporch or in a greenhouse. 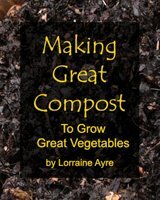 They are too difficult to plant, manage, water and harvest if grown in the vegetable garden. Because microgreens are so tiny when harvested, they are planted differently than ordinary garden seeds. When planting seeds in a garden, you leave enough room around the seed for the plant to reach full size. In contrast, when growing microgreens in trays the seeds are planted very close together, almost touching, so that you can gently grip a handful and harvest many at once, and so that you can minimize the amount of space and potting mix they will use. You can buy seedling trays at most better nurseries. I use shallow, 1 1/8" deep "germination trays", because they use less potting mix, and for the short time that the microgreens are growing, they don't need deeper soil than this. But any shallow dish or tray will work. If you're just growing microgreens to harvest for the occasional salad, drainage saucers made for going underneath plant pots work well, as do cafeteria trays. Now because microgreens seeds are planted so close together, If you plant them under the the surface of the soil they will push up the soil in a solid mat because there is nowhere for the soil to fall away to. This makes it impossible to cleanly harvest the microgreens. For this reason, seeds intended for growing microgreens are planted on the surface of the soil. To keep them moist until they are fully germinated and have sent roots down into the soil, you need to cover them. Many growers cover their seeds with paper towels and then water right through the towel. This works quite well to keep the seeds moist until they are fully germinated. You can also use a clear plastic "greenhouse" cover sold where trays are sold, or even use another, empty tray upside down over the seeds. When first starting out growing microgreens, it's a good idea to start with peas and sunflowers - because they are both easy and delicious. Because peas and sunflowers are large seeds they will germinate better and faster if you soak them in water for 2-8 hours before sowing. Most seeds do not need to be presoaked before planting, however, and you should never soak arugula or basil seeds, because they are mucilaginous and will stick together, making them impossible to plant. Don’t let the seeds soak longer than 8 hours or they may drown, because they need air as well as water. When you are ready to plant, drain off the water using a strainer or fine colander and gently pat the seeds dry on a clean cloth or paper towel. They have been activated into the germination process by soaking, but it's harder to evenly spread wet seeds that dry, so give them 10 or 15 minutes to dry on the towel before sowing. Now set your tray or saucer on a flat, level surface. Pour the potting mix into the tray, and spread it out as evenly as you can. Press it firmly into the edges and corners, and all across the surface. Remove any large chunks in the potting soil that will prevent roots from finding their way down. It is important to get the surface as evenly flat as possible, so that when you shake the seeds onto it, they won’t roll down into any low spots and concentrate there. Put the seeds back into a dry plastic cup or jar and shake them onto the surface of the soil as evenly as you can. After you've done this you'll notice places where they are too thinly or too thickly planted, and you can use an ordinary dinner fork as a little "rake" to spread them out more evenly. You will get a better yield and have fewer problems with fungus or poor rooting if you take your time and try to make sure that the seeds are spread out as much as possible. During the entire time that the seeds are germinating they must stay moist. If they dry out at this stage they will die. Cover them with a fine-weave cloth (roots will stick to a course weave) or paper towel, and water right through the cloth or towel. The cloth will help keep the seeds moist between morning and evening waterings. Water with a gentle spray nozzle, mister, or watering can with a “rose” spray end. 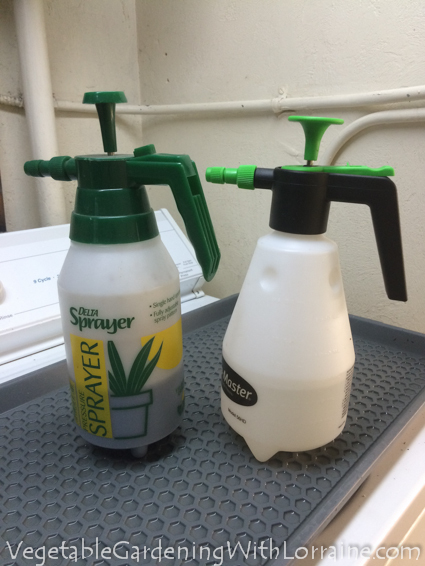 A half-gallon hand-pump sprayer from Home Depot (or elsewhere) works great for watering microgreens at every stage of growth. After a couple of days, you will see a white tip emerging from the seed. This is called the radicle, and will become both the root that grows down and the shoot that grows up. It is fun to observe this process closely with a hand lens. My two hand-pump sprayers, one with water and one with liquid kelp fertilizer. Because microgreen seeds are grown on the surface, sometimes the root tips have a hard time getting a purchase in the soil and sending their roots down.To aid in this, you can do one of two things. The first is to cut a piece of waxed cardboard to just fit inside the tray at the surface of the soil, and place it on top of the paper towel. Weight it down with a brick or stones. The cardboard will give the emerging seedling something to push against so that it can send its root down. NOTE: regular cardboard will get soggy and possible moldy. Use waxed cardboard, which is available from most grocery store produce departments. Their wet produce, such as lettuce, usually comes packed in these waxed cardboard boxes, and they will usually give you one because they are not recyclable and they get thrown out anyway. The second way uses another tray or saucer stacked right on top of the first instead of cardboard. This works beautifully if you want to germinate more than one tray or saucer at the same time. You can stack 2, 3, 4 or more on top of each other, and only the top one will need a cover with a weight. Or you can just leave the top one full of soil but unplanted. For my larger operation, I use a piece of Formica-covered plywood cut to size as my top tray weight, and if you really get into growing microgreens, you might want to make one yourself. In the meantime, a piece of weighted waxed cardboard or a top tray filled with soil will work fine. Remove the cardboard when watering, and just wet down the paper towel. Peek underneath the paper towel every morning and evening until you see that the little seedlings have gotten roots down into the soil, then carefully remove the cardboard and paper towel. This can take 1-2 days depending on warmth and moisture levels. Sometimes a few seedlings will stick to the paper towel and get uprooted when you remove the towel. If they do, you can either try to set them each carefully back into the soil, or just compost them along with the paper towel. Next the seedlings will open their cotyledons. Once they are open, the seedlings can be placed under lights or in a sunny windowsill. One advantage to lights over a windowsill is that the lights are directly overhead and the seedlings will grow straight up. Since growing plants use mostly red and blue spectrum lights, a standard cool white fluorescent bulb works fine. More expensive “daylight” bulbs offer no advantage during the early stages of growth. In a windowsill, microgreens will bend toward the light and flop to one side. You can minimize this by turning the tray around every day. You can also place your tray outside in shade or direct sun, but make sure they don’t dry out in their shallow trays, especially in the hot days of summer! Larger microgreens like sunflower and pea can be gently watered from overhead throughout their grow cycle. Smaller microgreens like amaranth or arugula have tiny filaments for stems and are easily flattened by overhead watering. I water these smaller microgreens from the bottom by putting about ½” of water in a boot tray and setting the tray of microgreens into the water for about 30 seconds until it soaks up some water from underneath. 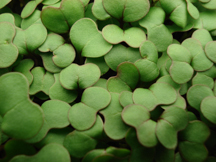 Microgreens are ready to harvest when their cotyledons are fully open and have reached a practical size for harvesting. With sunflowers, wait until they have all dropped their seed coats and the cotyledons are nice and large. With peas, wait until the first true leaves appear and have opened. If you are harvesting right before you eat them, you can use scissors to harvest. Gently grasp a handful of microgreens and cut them just above the soil surface. Be carefully not to inadvertently pull any up by the roots, or you will get dirt in the mix. If you are harvesting to eat later, cut the microgreens with a very sharp knife. This gives a cleaner cut and the microgreens will last longer in the fridge. If you wait too long to harvest and the microgreens fully develop their first true leaves, they will start to lose flavor and may become stringy or tough. Enjoy as a topping on salads or soups, in wraps or burritos, as a garnish on top of cold-cut sandwiches or burgers, or as a garnish on fish. Sunflower greens are great in smoothies or whizzed in with guacamole. Ocean Forest Potting Mix: Check local nurseries or hydroponics stores.